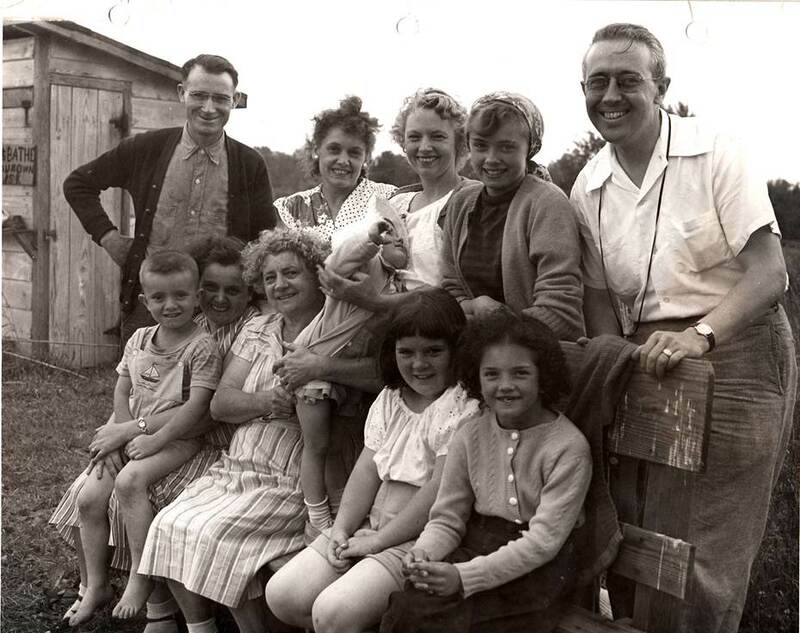 Pictured above is the Hornbeck farm in Hurleyville, New York with Lawrence Hornbeck and his family posing in front. 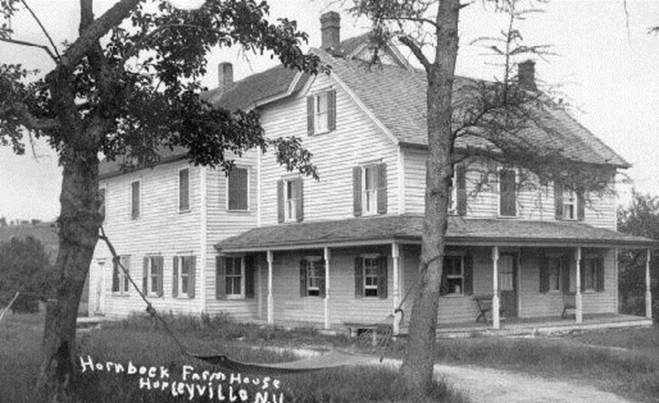 The Hornbeck family first arrived in Hurleyville when Matthew Hornbeck (born October 15, 1768, probably in Rochester, now Accord, Ulster County, New York; died August 17, 1856 in Hurleyville) moved there from Samsonville in Ulster County, where he had a store where Indians came to melt lead for arrows. Family legend claims he had a map to an Indian lead mine. Matthew married Elizabeth Wood c. 1797 in Rochester/Accord. She died February 4, 1864 in Hurleyville. 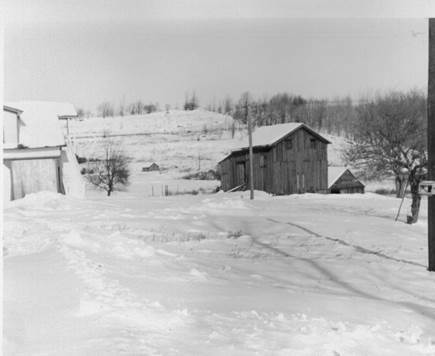 In Hurleyville Matthew first bought "the Mannon Place" in the town of Thompson and is listed there in the 1850 census. He is buried in the Hornbeck family cemetery in Hurleyville, located on the "Hornbeck Homestead" on which Goldie Durland Hornbeck lived last. His tombstone remains, along with one bearing the initials "SEH". Matthew and Elizabeth had thirteen children, including Lawrence (born November 14, 1811 in Hurleyville; died April 30, 1897 in Hurleyville). In 1856, Lawrence married Catherine Gardner. She was born January 6, 1827 and died January 13, 1890 in Hurleyville. When I was first researching the family, as a child of nine or so, Catherine (Katie) Hornbeck Coburg was my primary source of information. 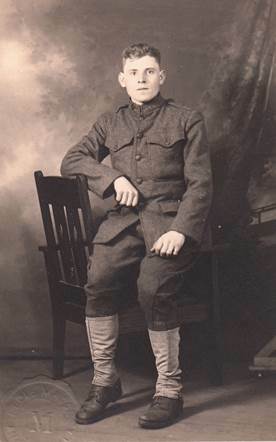 She thought her grandmother's maiden name might have been Barrigan, because Lawrence's sister, Catherine Jane Hornbeck, had married John Barrigan and she thought that Lawrence's wife might have been his sister. This turned out to be incorrect but by the time I discovered that I passed the information on to someone compiling a Hornbeck genealogy. You will find my mistake in print but it is still a mistake. Lawrence built the homestead on Columbia Hill, AKA "the farm." 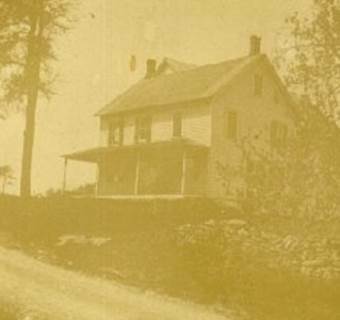 The Hornbeck farm was situated on what is now called the Whittaker Road. It is reached by driving south through Hurleyville along Main Street (Rt. 104), up Columbia Hill Road and turning left at the top (Rt.107). 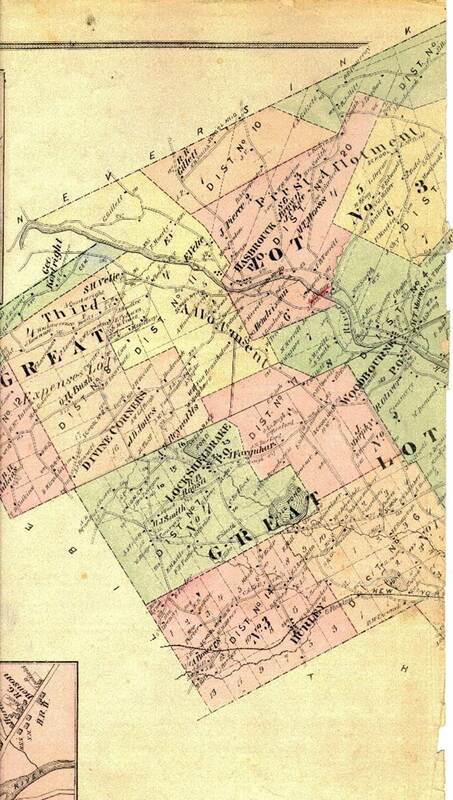 It was given a value of $1000 in the 1860 census. 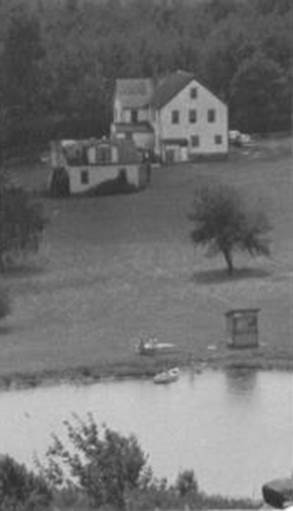 In 1872 the farm was listed as consisting of 75 acres. The town line between Fallsburgh and Thompson was at the foot of the hill, so to get a true picture of the area, you need to look at two maps. 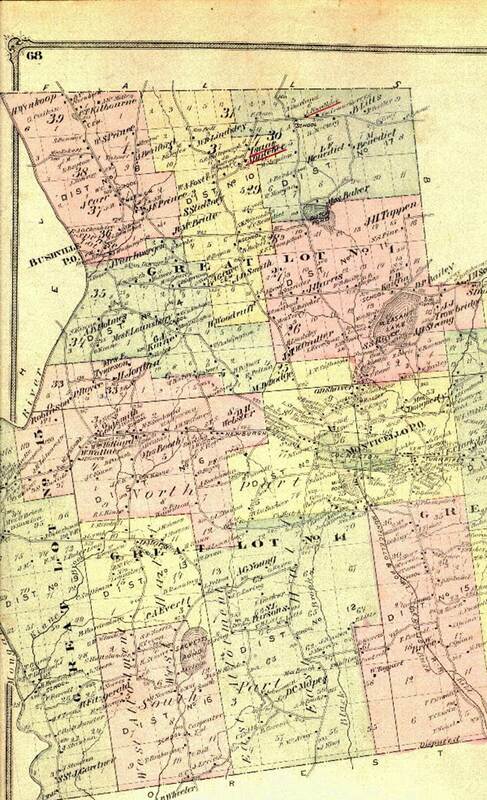 Those below come from the 1875 Sullivan County Atlas. 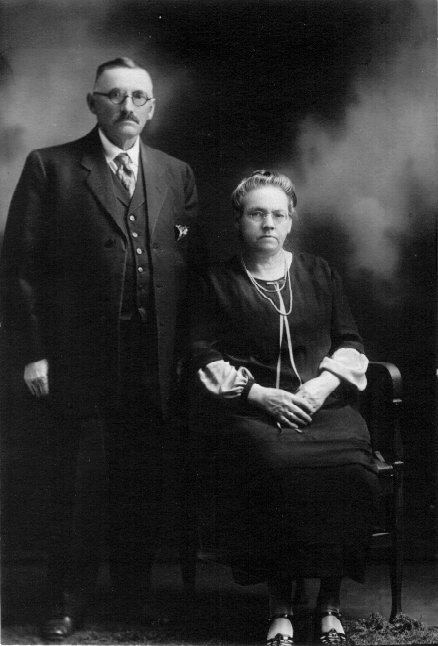 Lawrence and Catherine had two children, Myron Gonzales (known as Miles) Hornbeck (January 19, 1861-March 4, 1948) and Constantia Elizabeth (known as Libby) Hornbeck (October 25, 1862-September 22, 1941). 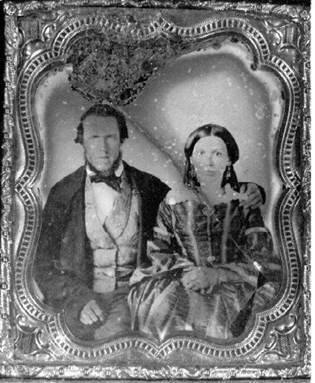 M. G. Hornbeck married Ella May Applebee, who also came from a farm/boardning house tradition. Pictured below is the Applebee House. 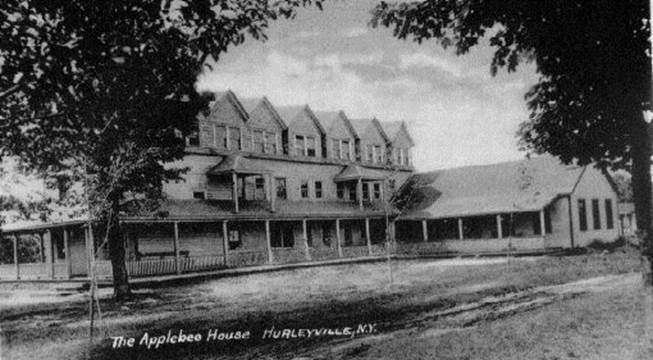 The Applebee House in Hurleyville was operated by Isaac and Mary Barton Applebee, parents of Ella Hornbeck. I believe it was on Rt.107 (the Monticello Road), reached by a right turn at the top of Columbia Hill. 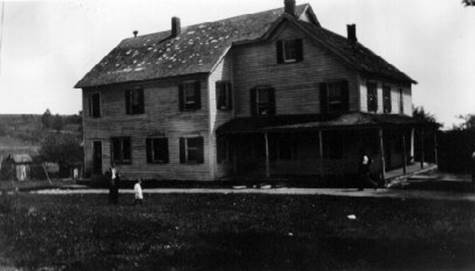 I have also been told it was called the Applebee Inn and later Fairlawn Farm and Fairlawn Acres. 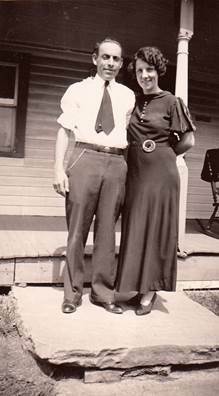 The other photograph shows Isaac and Mary Applebee. 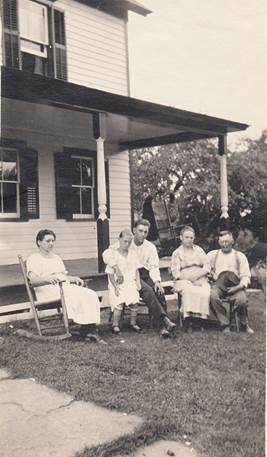 M. G. and Ella Hornbeck had six children: Tressa Estelle, Ida Arlena, Catherine May, Myron H., Luella, and Howard Clark Hornbeck. Shown above are M.G. 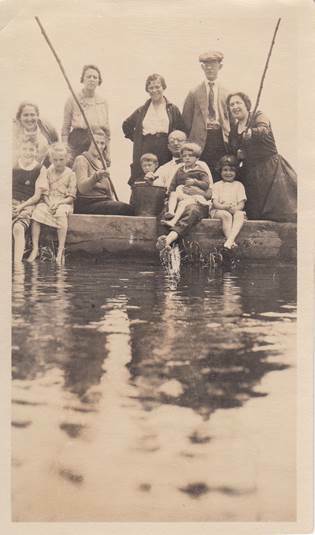 and Ella in both photographs and their five surviving children in the second. 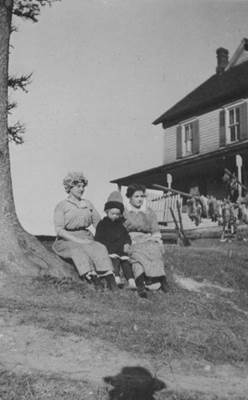 The children from left to right are Lu, Katie (seated) M.H., Ida (seated), and Howd. M.G. 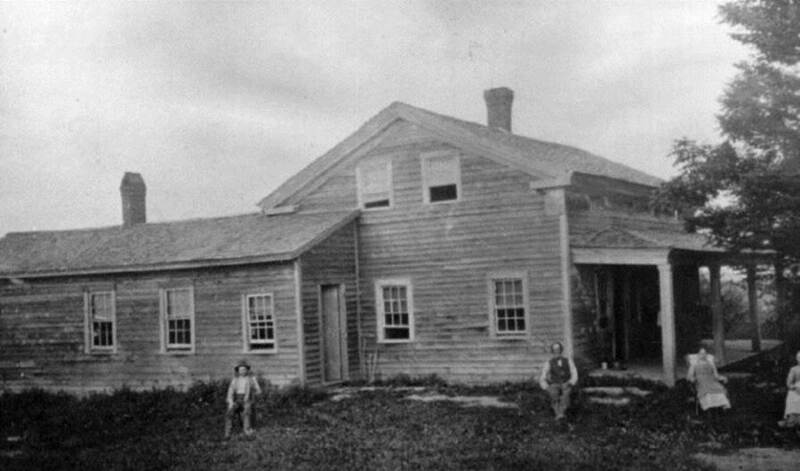 farmed the land and managed the boarding house, which at one point was called the Lafayette House. The property was left in equal parts to his five living children and the child of his deceased daughter but Katie Hornbeck Coburg (she had married her sister's widower in 1934) continued to live there until her death in March of 1958. She took in tourists through the summer of 1957, although by then separate kitchens had been installed in the "boarders'" dining room and the family had ceased to provide meals for those who stayed with them. After Katie died, the farm was sold. It burned down several years later. The only thing left now is a cellar hole. 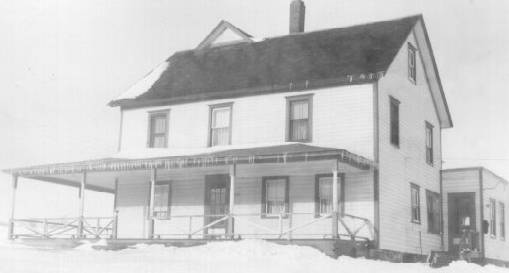 The photograph below shows the house as it was in the second quarter of the twentieth century. 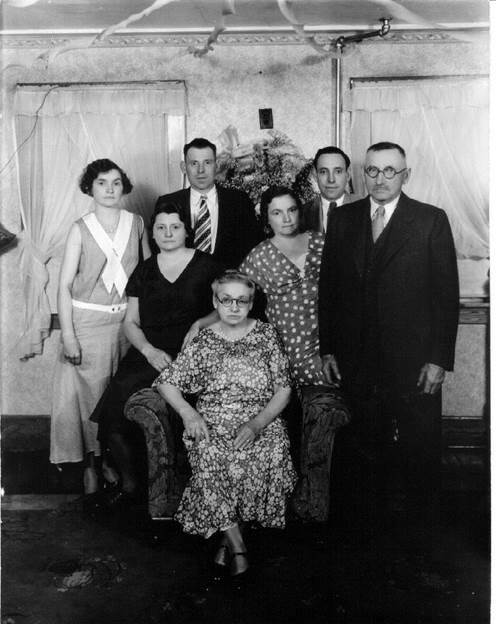 My mother, Theresa Marie Coburg Gorton, was the daughter of Tressa Estelle Hornbeck Coburg. 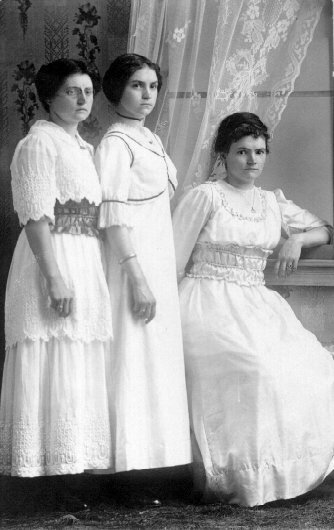 Tressa died shortly after giving birth in 1910 and Marie, as she was called, was raised by her grandparents and her Aunt Katie. In a series of interviews in 1987 she recalled life in a summer boarding house when she was a girl. 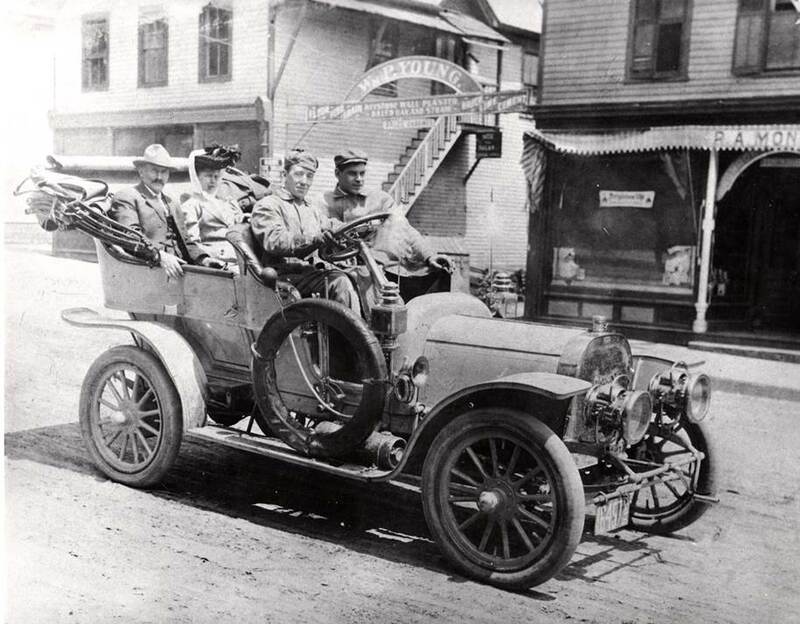 There were over 200 hotels in Sullivan County in the 1920s - none would use a Liberty address because Liberty was associated with tuberculosis cures. There were hotels up Goldie's road (the road M.H. and Goldie Hornbeck lived on). On the other road to Monticello, new ones were built. 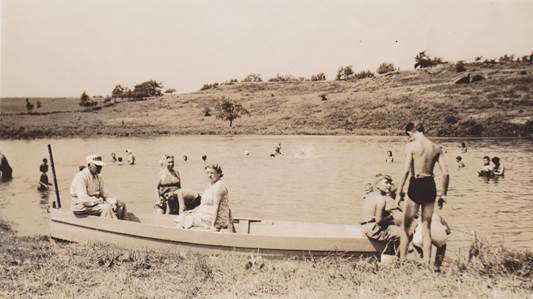 Gurney's Hotel (later burned down) bought water from the Hornbeck pond. They had a little house, a big house, a casino, and dances. Casinos at hotels were separate buildings for dancing and entertainments by summer staff, bands, etc, NOT for gambling. No money gambling was allowed in New York State [NOTE FROM KATHY: I'm not sure that meant there wasn't any!!!]. We had guests Decoration Day weekend, then the last of June/1st of July. On July 4th we had sparklers and firecrackers. We were too involved in the boarding house to go to coaching days but my aunts and uncles did in the old days. All the farms took in boarders. 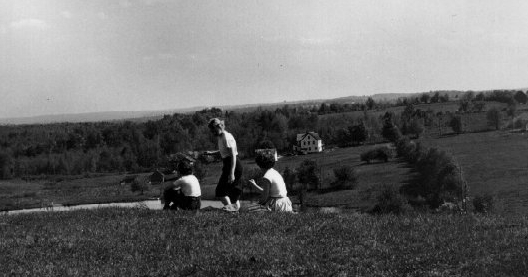 It was all boarding houses along the road: Aunt Carrie's, Cohen's, and Hornbeck's. Many built new buildings or built on. 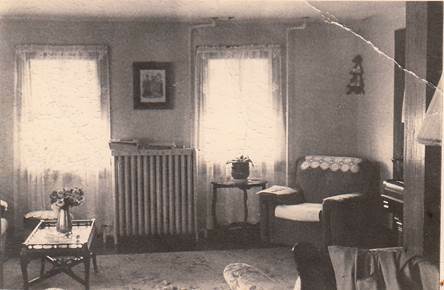 The "addition" to the boarding house was built on in the back - 6 bedrooms upstairs and downstairs was a big dining room and a kitchen as long as the dining room. Off the back was a hall. Off the front was the writing room. You went through the writing room to get to the dining room and there was a door out of the back of the dining room. To serve, food was slid through a hole in the wall to the waitresses. There was a shelf for plates. There were no individual tables, just long tables. My grandmother cooked, but sometimes they also hired summer cooks. 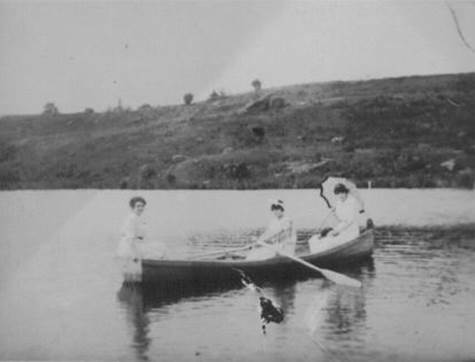 One older New York woman, an Irishwoman, left because it was "too damn lonely in the country." Another time Lena Bauers and her husband and son came and the couple cooked. There was a built-in flour bin over the countertop in the family kitchen and a griddle on top of the stove. There was one bathroom, upstairs - I'm not sure when that was put in. There were chamberpots. The boarders cleaned their own or left a tip. Family cleaned rooms and made beds for boarders. We had to bathe and dress for dinner at 4 PM. The bathroom was upstairs. The boys had the room next to bath and there was a crack in the door. The big long room downstairs was used by M.G. and Ella in the winter but given to boarders in the summer (the Getzens); M.G. slept on a featherbed on top of the grand piano in the dining room. M.H. and Howd had an apartment in the barn reached by outside stairs. The apartment over the garage was put in around World War II at about the same time the change was made from boarders to roomers [NOTE FROM KATHY: several small kitchens were put in where the large kitchen had been. That was the way I remember it from the 1950s]. The three big trees in front were evergreens. The old winter kitchen was flush with house and had a door to the side with a narrow porch and steps. We had a big ice house and a water tower (for summer only). We had a crank telephone on the wall. We had electricity. To make more room for boarders, the family slept in the attic where there was a big bed on one side and mattresses on the other. Sometimes there were as many as 35-40 people in the house with two full beds in some rooms. Most rooms had two beds and some also had a cot so they could sleep the whole family in one room. Often the same people took the same room year after year. There were Irish-Americans, Italian-Americans, and Jewish-Americans among the guests. Young people came too and the family socialized with them after chores were done. There were dances in the winter dining room with bands. There was a flag raising ceremony every day. The radio station was KDKA and we had a Victrola. 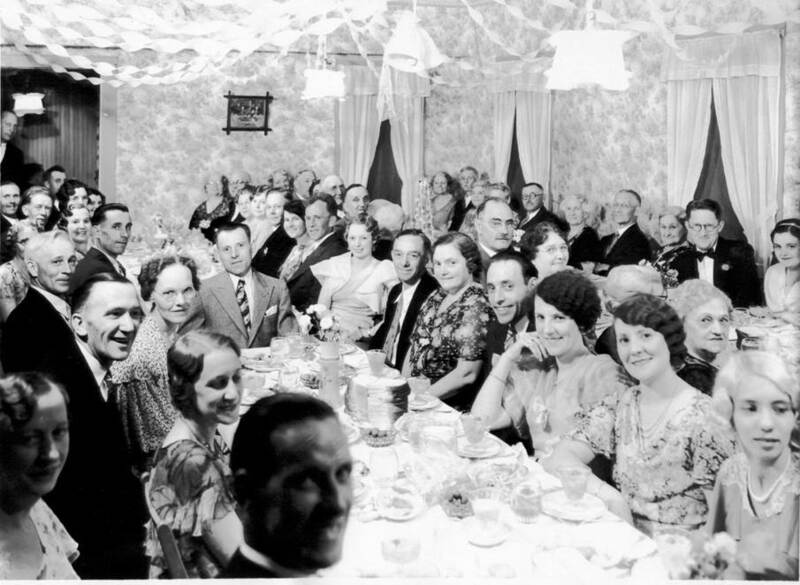 Some of the names of guests were Mrs. Davis, Mrs. Woll, the Quirks (Irish family) and the Seligs (did their own cooking and ate in a corner; no bread and butter). Aunt Katie went to a Selig girl's engagement party. Also the Silvers - Irish wife, Jewish husband. In the summer, the older children waited tables while the younger children washed dishes. There were big drying racks for dishes - no wiping. I had lots of play time. We had swings, swimming, boating, climbing the hill in back of the lake. We went barefoot a lot. Walter's entire family came up in the summer to work. (Kathy: this was Walter Crosby, who married Ida Hornbeck, and their daughters Eleanor and Martha.) My cousin Eleanor worked at Aunt Carrie's. 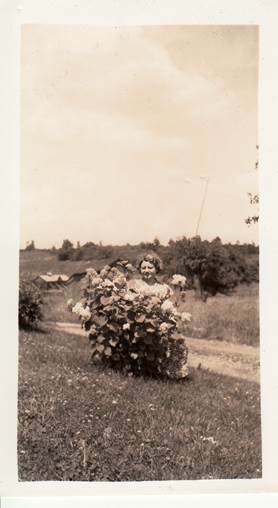 Aunt Carrie (Lounsbury) was the first woman in the area to bob her hair and drive a car. Aunt Carrie also employed Mexicans but was always afraid they'd run off. We'd run out (to get away from chores). I don't ever remember acting up at the table. We ate what we had. Martha and I would try to run upstairs, any excuse to get away. That was when Eleanor was there. One year she took a job with Aunt Carrie to get away with us. We used to go up on the hen house roof and tease the bull and then he'd run. One time he got real mad and ran through the sheets in the orchard. A typical mid-day meal was chicken on Sunday with homemade ice cream, biscuits, a choice of pies and cakes, veg & salad & soup, pickles, etc., served at a big long table, family style. Certain days=certain things so you could plan ahead. The evening meal was lighter: salmon, cold cukes, potato salad. We had a big breakfast: cereal, juice, eggs, bacon, toast, sometimes pancakes but no choices. Some special diets were accommodated. There was nothing in Fallsburgh then. 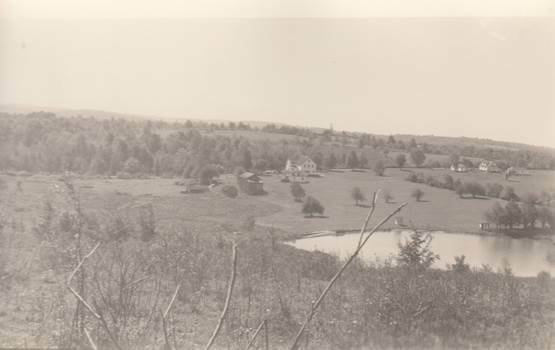 Shopping was done in Hurleyville - people came there from Fallsburgh, Woodbourne and Loch Sheldrake to shop at Van Keuren's butcher shop. There were also Jewish shops. Uncle M.H. worked for Lawrence - he drove all over in a truck with fruits and vegetables, delivering to the houses. Still many things came from home: milk, eggs, we made our own bread. There was a dress shop in Liberty that New Yorkers raved about. For movies we went to Monticello and shopped at Hammond and Cook. Prohibition was ignored - had home made wine and white lightning. When there was a deadbeat, they called Sheriff Farquhar. There was not a lot of prejudice in the area. There were some smart asses, but they had no particular target. 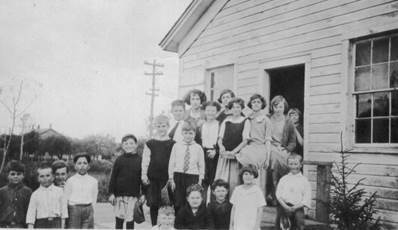 Schoolmates were mostly Jewish. Cousin Walter was Catholic (lapsed). There was one colored man in town (Doc) who sometimes stayed at the farm as a helper. A KKK cross was burned on Columbia Hill. There were lots of cars. The Lounsburys were involved but the town wrongly thought the cross was on Hornbeck land and that almost lost us the ice business. The family did talk about my mother. They all said she was pretty and that she was very vivacious and I remember my grandmother and Aunt Katie saying Tressa would say "I'm not going to have any life insurance on me. They can just throw me out when I die. I'm not going to worry about any insurance." Everybody had a little insurance then. She had a boyfriend before my father. My aunts all had boyfriends from New York. I only saw my father every few weeks. 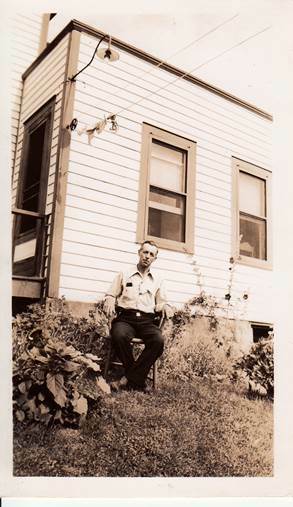 He was a trainman and went from New York to Oswego and different places. I can remember he always brought me something, a present. He brought me bathrobes and dresses. I had dolls already. "Doc" brought me presents, too. My grandfather spoiled me. I couldn't do any wrong. No one ever discussed why Aunt Katie didn't marry her sister's husband until after my grandmother died. I walked in my sleep as a girl. One night I got up and I started to walk down the stairs, the back stairs, and Aunt Katie heard me and she started after me. I guess she caught me downstairs but I didn't know until I woke up. And then I used to hang out of the window in my sleep. Not my whole body, just my elbows. Then one night I evidently got up and I was in the new section I think and Aunt Ida and Uncle Walter were sleeping in that section and I pounded on the door because I wanted to tell them something but when I woke up I couldn't remember what I wanted to tell them. Sometimes in the winter hanging out the window would be cold but it wouldn't bother me. I was in an accident in an old Buick that was cut down and had just the seats on it. Painted red. Two seats in the front and a place to sit on a board in the back. Martha and I were in the seat. The brakes gave way. He said stay in and I thought he said jump out and Martha was hanging on for dear life. This was down across the hill and back. We didn't hit the garage. We went right through the gates that kept the animals in. Uncle MH took me out driving when I was 13 and he got a ticket for letting me drive. A State Trooper gave him a ticket. I used to take the car and go around and around the driveway. That was my grandfather's car, the one I got my license on. I drove it when I worked for the telephone company. That was one that had a shift. Everyone was a Republican: Grandfather (M.G. Hornbeck) was superintendent of roads and a school trustee, so he hired the teachers. The smell of cucumbers=milk snake. 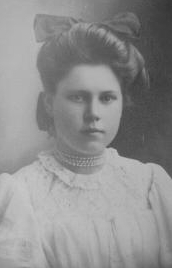 Marie would sit down on a very small chair in the kitchen and Aunt Katie would have to braid her long hair before she went to school. Marie would say "tighter" and Katie would say, "I think it's tight enough." And Marie would say "no, tighter." And she would keep shouting "Tighter! Tighter!" until the whole braid was finished and her skin was literally popping out of her head. That's the the only way she would do it, every single day, and we had to wait. We knew we were going to be late but Marie needed her hair braided tight. Most of the children liked to come to Marie's because she had all the toys and we always played in the orchard near the chicken coops. We had one girl, Mary, who was very unhappy because she always wanted to be the mother. To keep peace we allowed her to be the mother. We used to go after the pigs and winter time we'd take barrel staves and go down the hill right onto the ice. 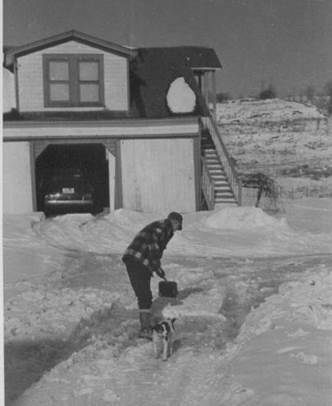 We used to have ice skating and watch the men cut the ice and put the ice into the icehouse. In the summer we had a boarding house and we had to work no matter how young we were. Our house was the Columbia Star House. Katie was like a second mother to us. She knew I loved rhubarb so she'd call "come up and get your rhubarb, I just made a rhubarb pie for you." I'd come running about a quarter of a mile, I guess. My brother Sam lived with them for a year and he used to do everything for them. He loved chocolate cake and she'd make any food he wanted. He was an adult by then (in high school) and he'd come and help with the ice. It was a beautiful love affair with the Hornbecks. Today you don't get that warmth from people. 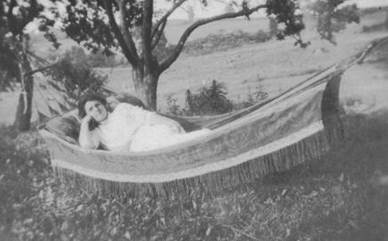 Anna Mauer Todd, another old friend of my mothers, grew up on a farm/boardinghouse as well. In 1987 she remembered that they had boiled cheese to eat. "They'd take great big metal spoons and scrape it out." They also had homemade bread and asparagus. In the summertime we'd pick wild flowers. We always had flowers on the table for the boarders. There was wallpaper in the outhouse. Men came with a team of horses to clean out the outhouse through a separate door and take out the contents. There was always a catalog hanging there to use the pages for toilet paper. In the summer kitchen apples were strung and hung from the ceiling to dry. Everybody had wine in their house during Prohibition. 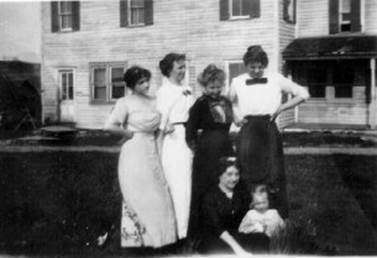 Below are a selection of photos taken of the Hornbeck farm from about 1900 until 1958.
in front of the house, c.1915? Grace Lounsbury, Ralph Lounsbury, Addie Lounsbury; Ruth Beebe?